With so much written about Social Media, we at Flash Point Communications thought we’d throw our two cents in. After all, we’ve been named one of Ford Motor Company’s preferred Social Media suppliers . We’ve been developing, launching and managing social media campaigns for car dealers and dealer ad groups since Social Media first emerged as a dominant player on the internet. And we’ve been making digital marketing work for car dealers for over 15 years. But we make car dealers a different promise than those self-proclaimed Twitter experts. While they’ll tell you they have magically cracked the social media code, we’ll tell you that we are mastering the fundamentals. One site, one program, one idea at a time. There is no magic. We just roll up our sleeves, invent, track, measure and learn every step of the way. And then we start all over again. In this spirit, we would like to share some ideas on “How to Make Social Media Work for Car Dealers.” Not because we’ve finished the job. But because we’re doing our best to listen, learn and test every day. Good news is: we’ve learned a few things along the way. So with that preamble, we’d like to share six building blocks we’ve discovered that make social media work really hard for Car Dealers. And to prove our points, we’ll base them on one of our best, real-world success stories: the Northwest Ford Dealers . 1. Set up a “Platform” that’s right for your business. Obviously, there are a mind-numbing array of social media applications and tools available (190+ according to Wikipedia). Each offers its own benefits, limitations and costs (explicit or implicit). We felt they were the best ways to tell the Northwest Ford Dealers’ unique story, get people involved, keep them involved and listen to (and respond) to their feedback. Could we have included more or different social media apps? Sure. But our thought was this: rather than do 5 or 6 things half-assed, master four. Get really good at them. Understand them. Then add to the mix. Will we add more tools to the arsenal in 2011? Maybe, maybe not. For now, we’re focused on just these four. 2. Have a set of business cards on you. OK, not literally. But we’ve all experienced being at a social gathering when talk turns to business. And when it does, it’s nice to be prepared with a business card. The same philosophy holds on your Facebook page. So we developed a “Shopping Tools” tab for the Northwest Ford Dealers offering everything from dealer inventory and a dealer locator to local offers and parts & service specials. In addition, all the pages are carefully tagged to gather critical metrics. Leads are then collected, analyzed and matched against sales. Who says you can’t measure ROI with Social Media? Contrary to some initial concerns, site visitor reaction has been very positive. In fact, rather than guess, we simply asked site visitors. They were more than happy to tell us what they thought. Check out some of their comments on our Facebook page. So for now, unless we learn otherwise, we’re thinking it’s best to keep a set of business cards on us (and our sites). 3. Engage, Energize and Activate the Retailers. This can be harder than it sounds. Activating a group of 60 to 200 dealers is not always an easy task. But it can be done. It starts with communication. That’s why we’ve developed an aggressive, monthly e-mail campaign along with a bi-monthly webinar series. Subjects we cover? Everything from the latest tips and tricks of Social Media to details of their ad group’s marketing efforts and specific action items to get them started. We’ll even share the top 10 Things they shouldn’t do. The more they know, the more they can share and contribute. The more they share and can contribute, the more lively and informative the webinars become. 4. Develop and supply effective selling tools. When the “conversation” moves to “I’m interested”, some Social Media agencies stop. Not us. In fact, these next steps are something we consider very carefully. 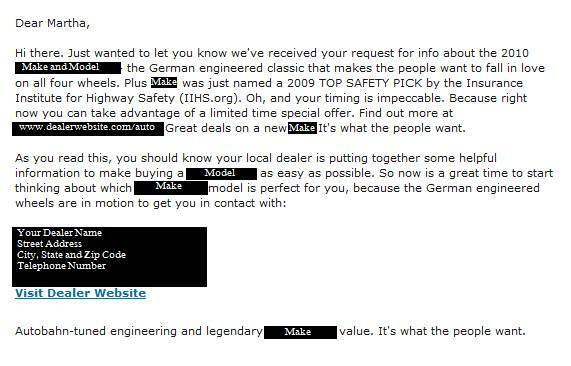 To start with, let’s look at the average dealer response to an online inquiry. Our secret shopper told the dealer she was “in-market”, ready to buy and wanted a quote. This is the note she got back. 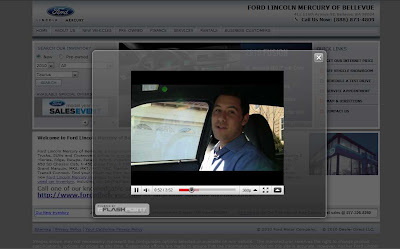 So for the Northwest Ford Dealers, we developed a set of “Virtual Test Drives”, leveraging talent from our “Spoof” videos. Very casual, very friendly and not over-produced. Utilizing our BunkBed technology, we’ve also layered each video over each individual dealer’s website, giving them an additional level of control. Once the consumer is done watching the video, they’re on the dealer’s website. Convenient for both. Good user experience. And the dealers aren’t sending them out to YouTube, never to be heard from again. It’s about your customers and prospects. With a robust event schedule, we’re turning residents in the Pacific Northwest into stars. How? By being out and about, taking pictures and videos. They have great stories about their Fords and more than willing to share their thoughts. Some whimsically remember their first Ford memory, car or truck. Others share stories about a car or truck they have now that just never quits on them. All these videos and photos are captured, tagged and uploaded to YouTube, Facebook, Flickr and shared via Twitter. The result? More awareness of upcoming events, better visibility of the event teams at the events, more fans and interaction on Facebook and better search engine placement throughout the Northwest. 6. Create content worth sharing. Make it different, relevant, hold the brand in high esteem and impart product knowledge. If it’s different, funny or interesting enough…and relevant to a specific audience, they may share it with hundreds, thousands, even millions of people. Sound easy? It isn’t. But it can payoff. And the Northwest Dealers jumped into the arena again this year with their Spoof on SNL’s “I’m on a Boat”. With over 46 million views, “I’m on a Boat” became the inspiration for Northwest’s “We in a Trailer”. With the goal of creating more awareness for their newly designed event trailer and aggressive event schedule, “We on a Trailer” aims to provide some unique and fun content to highlight their market, partnerships and events. Just launched, the group is now tagging emails, embedding on their website and reaching out to dealers to post on their pages. In the end, we know it’s about selling cars, trucks and SUV’s for our clients. We also know that the world is changing. Online behavior has changed. And fewer and fewer of us are seduced by the cold expectancy of a lead capture form. Engage, invite, socialize and entertain has indeed become a part of the marketing mix. And with the above 6 steps, we’re out to make the Northwest Ford Dealer’s Social Media efforts pay off. Indeed, become world class. And not by thinking about just the short term. But by building a community. A community of energized and knowledgeable dealers. And a community of real Ford fans. There will be missteps, mistakes and dead ends. And the whole process won’t be “easy”. But nothing worthwhile ever is.